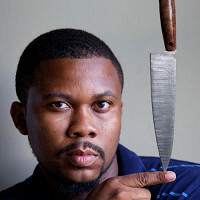 Quintin Middleton grew up with an interest in knives and swords—and, as a Southerner, he knows his way around shellfish. His put his ten plus years as a master blade smith into redesigning shellfish and shucking tools for Middleton Made Knives. Quintin hails from South Carolina, so he’s no stranger to crab legs—but he found that traditional crackers weren’t super helpful in breaking them down. He created the Kraken based off of his mother’s seam ripping tool—with a slightly hooked tip to get into joints, and a prong for de-veining shrimp. 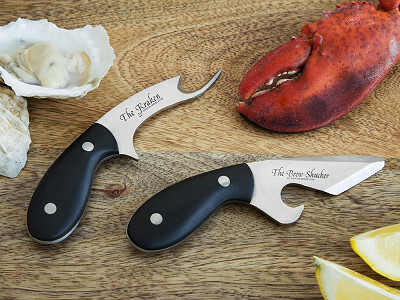 The Brew Shucker is his combination of an oyster shucking knife and bottle opener—the perfect pairing for backyard seafood fests. The scaled-down design makes it easy to handle, and its solid weight feels secure in your grip. Leave no oyster un-shucked, and no crab leg intact. With these tools on hand you can enjoy shellfish with way less hassle. Hello everyone! I'm proud to introduce The Brew Shucker and the Kraken to The Grommet. I'd be happy to answer any questions you have! Can we purchase The Brew Shucker and The Kraken as a set at a slightly reduced rate? Not at the moment, Rhonda, but buying them both does qualify you for free shipping. I echo Rhonda's question! I would be interested in buying the set if the price were right. The price would be right to receive free shipping if you bought them both, Jim. How do they come packaged? Do they have their own safe holder to keep in a drawer? My son-in-law is a wonderful cook, but they have limited space and a 3 year old. would love to give them to him as a birthday gift. Middleton is from the south, but the knives are made in China? Hi Donna, all of the knives are designed in SC. Quintin Middleton grew up with an interest in knives and swords—and, as a Southerner, he knows his way around shellfish. His put his ten plus years as a master blade smith into redesigning shellfish and shucking tools for Middleton Made Knives. Quintin hails from South Carolina, so he’s no stranger to crab legs—but he found that traditional crackers weren’t super helpful in breaking them down. He created the Kraken based off of his mother’s seam ripping tool—with a slightly hooked tip to get into joints, and a prong for de-veining shrimp. 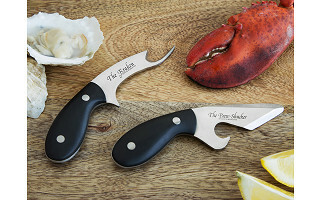 The Brew Shucker is his combination of an oyster shucking knife and bottle opener—the perfect pairing for backyard seafood fests. The scaled-down design makes it easy to handle, and its solid weight feels secure in your grip.